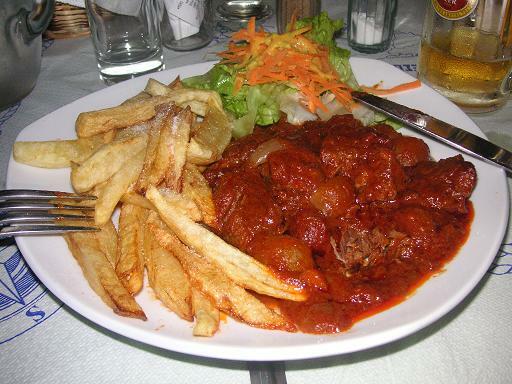 Stifado is a favorite dish in Cypriot cuisine and Greek cuisine. It is a stew made using beef, tomato, and onions, and flavored using red wine, herbs and spices. Peel and chop the onions and lightly fry them in a little olive oil. Remove the onions from the pan. Cut the beef into cubes, and cook these in the same pan until they become lightly brown. Then turn the heat as low as possible. Chop and peel the garlic cloves. Chop the tomato. Add the onions, tomato, garlic, the vinegar, the red wine, cloves, the bay leaf, the peppercorns, and the cinnamon stick, as well as a pinch of the salt and pepper, to the pan. Add about 3 tablespoons of olive oil, and enough water to just cover the meat. You will need to cook the stew for 2 to 3 hours. During this time the meat will become very tender, and virtually all the water will be absorbed (it may be necessary to add more water during the cooking process). When ready to eat, you can garnish with a little fresh chopped parsley or with oregano if you wish.